RASPBERRY, RUBY BEAUTY (Rubus idaeus Ruby Beauty). Amazing new Raspberry which only grows to 1m high and will only need support if the weight of the fruit bends the canes too much. Multi-branching and thornless producing up to 1.5kg (3lb 5oz) of large, delicious, sweet raspberries in mid-summer from each plant. Easy to protect from birds. Plant 50cm (20ins) apart in well drained soil in sunny position for a dense, deciduous hedge, ideal for the edge of a vegetable plot, or one plant makes a very attractive plant in a large pot on the patio. ROBINIA PSEUDOACACIA (False Acacia, Black Locust). Excellent fast growing thorny barrier. Young branches bear short, sharp hooked spines, which help protect it from grazing stock. Pale green lush foliage turns a good yellow in autumn. Large pendulous bunches of pea-like, fragrant white flowers in June which are attractive to bees. Tolerant of atmospheric pollution. Deciduous. HEDGE Trim in winter and after flowering, if necessary. For hedges 5-10ft (1.5-3m). Plant 2ft (60cm) apart. TREE 30ft x 15ft (9m x 4.6m) in 20 years, ultimate height 80ft (24m). ROSE, BLANC DOUBLE DE COUBERT (Rosa Blanc Double de Coubert). Vigorous, deciduous, dense and prickly bush with disease-free leathery mid-green leaves. Profuse, large, semi-double, very sweet-smelling cupped to flat white flowers with yellow stamens in June which continue into autumn. In some years these are followed by spherical red hips. Makes an excellent impenetrable hedge. HEDGE Trim as necessary in winter. For hedges 4-5ft (120-150cm). Plant 12-24ins (30-60cm) apart. SHRUB 6ft x 4ft (1.8m x 1.2m). AVAILABILITY: Click on Check Availability to check stock. Items marked Br (Bare rooted) and RW (Root-Wrapped) can normally be sent between November and March. Items marked Pg (Pot grown) are normally available all year round. ROSE, DOG ROSE (Rosa canina). Large native fast growing deciduous shrub with arching branches bearing two inch (5cm) wide white to pale pink flowers in June followed by glossy red egg-shaped hips in autumn. These are good for rose-hip syrup, or provide excellent bird food in winter. HEDGE Trim in winter if necessary. For hedges 4-5ft (120-150cm). Plant 12-18ins (30-45cm) apart. Can be used to thicken a mixed hedge. AVAILABILITY: Click on Check Availability to check stock. Items marked Tr (Transplanted) and Sd (Bare rooted seedling) can normally be sent between November and March. Items marked Pg (Pot grown) and CG10 (Cell Grown) are normally available all year round. ROSE, FIELD ROSE (Rosa arvensis). Common native rose of hedgerows and woods with long slender stems which trail into other plants or form a dense mound. White flowers, 1.5-2ins (4-5cm) across in July followed by dark red hips, which make excellent bird food. Shining green leaflets, which persist well into winter. Deciduous. HEDGE Trim in winter if necessary. For hedges 6-8ft (1.8-2.4m). Plant 18-24ins (45-60cm) apart. Plant with other species for added interest. Trim in winter if necessary. SHRUB 10-12ft x 8ft (3-3.7m x 2.4m). ROSE, FRU DAGMAR HASTRUP (Rosa rugosa Fru Dagmar Hastrup). Excellent disease-free low growing deciduous hedge with lush dark green foliage. Very fragrant, single, pale rose-pink blooms from June to autumn, followed by a profuse crop of rich crimson hips, useful for rose-hip syrup or makes excellent bird food in winter. HEDGE Trim in winter if necessary. For hedges 2.5-4ft (75-120cm). Plant 12-18ins (30-45cm) apart. SHRUB 4.5ft x 3.5ft (1.4m x 1m). ROSE, GLAUCA (Rosa glauca) (R. rubrifolia). Attractive grey-purple foliage on slightly thorny deep purple stems. Clusters of clear pink flowers in June followed by red fruits in autumn, which make excellent bird food in winter. Makes a good dense fast growing deciduous hedge. HEDGE Trim in winter if necessary. For hedges 4-7ft (1.2m-2.1m). Plant 12-24ins (30-60cm) apart. SHRUB 7ft x 5ft (2.1m x 1.5m). ROSE, HANSA (Rosa rugosa Hansa). Very fragrant, fully double, well-formed crimson-purple flowers throughout the summer on dense fast growing deciduous plants covered with small bristly thorns. Large red hips in autumn which are good for rose-hip syrup or excellent bird food in winter. SHRUB 5ft x 4ft (1.5m x 1.2m). AVAILABILITY: Click on Check Availability to check stock. Items marked Tr (Transplanted) and RW (Root-Wrapped) can normally be sent between November and March. Very vigorous deciduous species with upright arching habit. A great profusion of large clusters of single, white, fruit-scented flowers fill the air with fragrance in early summer and these are followed by masses of small bright red hips in autumn, which make excellent bird food. Can be used to ramble into trees or to cover ugly banks. HEDGE Trim in winter as necessary. For hedges 6-10ft (1.8-3m). Plant 18ins (45cm) apart. SHRUB 10-15ft x 8-10ft (3-4.6m x 2.4-3m). ROSE, ROSERAIE DE L'HAY (Rosa rugosa Roseraie de L'Hay). One of the finest rugosa roses for hedging with its dense habit and vigorous growth. It has tough, healthy, wrinkled, pea-green foliage and bears large cupped to flat, 4.5 inch (11.5cm) wide, velvety, rich wine-purple double flowers which fill the air with a wonderful fragrance from June to autumn. Deciduous. HEDGE Trim in winter if necessary. For hedges 5-6ft (1.5-1.8m). Plant 12-18ins (30-45cm) apart. SHRUB 7ft x 7ft (2.1m x 2.1m). AVAILABILITY: Click on Check Availability to check stock. Items marked Br (Bare rooted) and RW (Root-Wrapped) can normally be sent between November and March. Excellent dense fast growing deciduous hedge with masses of small bristly thorns, and large orange-red hips in early autumn which are good for rose-hip syrup, or make excellent bird food. Heavily scented large flowers usually deep pink, June to September. These plants are grown from seed so there can be a variation of flower colour from white to deep pink. HEDGE Trim as necessary in winter. For hedges 4-7ft (1.2m-2.1m). Plant 12-24ins (30-60cm) apart. SHRUB 7ft x 4ft (2.1m x 1.2m). AVAILABILITY: Click on Check Availability to check stock. Items marked Tr (Transplanted) and Sd (Bare rooted seedling) can normally be sent between November and March. ROSE, RUGOSA RED (Rosa rugosa Rubra). Excellent dense fast growing deciduous hedge with masses of small bristly thorns. Fragrant, large, purple-red flowers June to September followed by large orange-red hips in early autumn which are good for rose-hip syrup or make excellent bird food in winter. These plants are grown from seed and a slight variation in flower colour may occur. HEDGE Trim in winter as necessary. For hedges 4-7ft (1.2m-2.1m). Plant 12-24ins (30-60cm) apart. ROSE, RUGOSA WHITE (Rosa rugosa Alba). Excellent dense fast growing deciduous hedge with masses of small bristly thorns. Heavily scented large white flowers June to September followed by large orange-red hips early autumn which are good for rose-hip syrup or make excellent bird food in winter. These plants are grown from seed and a slight variation in flower colour may occur. ROSE, SCOTCH or BURNET (Rosa pimpinellifolia, R. spinosissima). Dense native deciduous shrub with new stems crowded with prickles and clothed with small neat fern-like foliage. Small, single, sweetly perfumed white to creamy-white flowers, with occasional colour variation, and with darker yellow stamens are borne in profusion during May and June. In autumn the bushes are heavily laden with shiny maroon-black fruits which make excellent bird food. Thrives in any soil, even sandy soils. HEDGE Trim if necessary in winter. For hedges 2-3ft (60-90cm). Plant 2ft (60cm) apart. SHRUB 3ft x 2-4ft (90cm x 60-120cm). ROSE, SWEET BRIAR (Rosa rubiginosa) (Rosa eglanteria). Very sweet smelling foliage, the fragrance being particularly strong in the rain. Cupped single flowers, 1 inch (2.5cm) across, usually bright pink, in midsummer, followed by orange-scarlet hips in autumn. These make excellent bird food in winter. Makes a good dense fast growing deciduous hedge. Native plant. HEDGE Trim in winter if necessary. For hedges 5-8ft (1.5-2.4m). Plant 12-24ins (30-60cm) apart. SHRUB 8ft x 8ft (2.4m x 2.4m). Evergreen. Very aromatic narrow grey-green leaves with white undersides. Pale blue flowers smother the old wood in late spring, then intermittently until autumn. Makes an excellent informal low hedge in a sunny position. Very useful culinary herb. Not suitable for cold sites. HEDGE Trim straggly shoots in April. For hedges 2-4ft (60-120cm). Plant 1.5-2ft (45-60cm) apart. SHRUB 6ft x 5ft (1.8m x 1.5m). See Mountain Ash or for ornamental varieties see Ornamental Trees section. Very strong growing, upright, thorny purple stems covered with a white bloom which is outstanding in winter. Attractive fern-like foliage, pale green above, white beneath. Small rose-purple flowers followed by bloomy-black fruits. Makes an excellent thorny deciduous hedge which soon becomes impenetrable to intruders. HEDGE Trim in winter. For hedges 4-7ft (1.2m-2.1m). Plant 2ft (60cm) apart. SHRUB 7-9ft x 5-6ft (2.1-2.7m x 1.5-1.8m). SANTOLINA (S. chamaecyparissus, S. incana.) (Cotton Lavender). Neat, compact, dwarf, hedge with deeply toothed, silver, woolly aromatic leaves on white felted branches. It will be covered with bright lemon-yellow pompon flowers, 1/2 inch (1.5cm) across, on long stems in mid to late summer. Cut off old flower heads and reduce long shoots in autumn. Sunny position, well drained soil which is not too rich. HEDGE Trim in summer. For hedges 12-18ins (30-45cm). Plant 12-15ins (30-38cm) apart. SHRUB 2ft x 2ft (60cm x 60cm). SERVICE TREE, WILD (Sorbus torminalis). TREE 20ft x 12ft (6m x 3.7m) in 20 years, ultimate height 60ft (18m). SILVER BIRCH (Betula pendula, B. verrucosa). SMOKE BUSH, ROYAL PURPLE (Cotinus coggygria Royal Purple). An outstanding deciduous shrub which has good sized dark red-purple foliage which turns scarlet in autumn. In summer it will become festooned with long stalked feathery purple-pink flower heads which give an amazing appearance of smoke. It produces the best coloured leaves in full sun. HEDGE Trim in winter. For hedges 3-6ft (90-180cm). Plant 2ft (60cm) apart. For more details, or to order see Ornamental Shrubs section. Strong growing deciduous shrub ideal for game cover, poor soil and dark places. Can be used as a hedge for difficult shady areas. Clusters of small pink flowers from July to September followed by masses of glistening white berries in autumn and winter. Any ordinary well drained soil. HEDGE Trim in summer. For hedges 5-7ft (1.5-2.1m). Plant 2ft (60cm) apart. SHRUB 7ft x 6ft (2.1m x 1.8m). SNOWBERRY, WHITE HEDGE (Symphoricarpos doorenbosii White Hedge). HEDGE Trim in summer. For hedges 4-5ft (120-150cm). Plant 18ins (45cm) apart. A wonderful selection of deciduous plants which will give interest with flowers or foliage all year. For more information and prices please click here. Vigorous native green-stemmed deciduous shrub or small tree with inconspicuous flowers in May. Can be very showy in autumn with red leaves and masses of rose-red capsules attractive to birds. 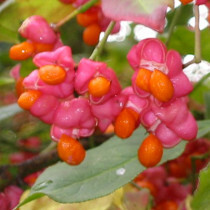 Spindle should not be grown in a farm hedge where beet and beans may be grown, as it is a host plant for beet and bean aphis. Any ordinary soil, sun or partial shade. SHRUB 8ft x 5ft (2.4m x 1.5m). SPRUCE, NORWAY (Picea abies) (Christmas Tree). 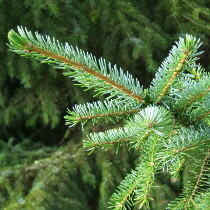 Fast growing evergreen conifer with shining dark green needles. Thrives on many types of soils. Is particularly happy in soils with a moderate or high acid content, and prefers a high moisture level. It cannot be recommended for really poor, shallow or dry soils. Will make an excellent evergreen hedge if well clipped. HEDGE Trim in spring. For hedges 5-10ft (1.5-3m). CONIFER 50ft x 20ft (15m x 6m) in 20 years, ultimate height 100ft (30m). Narrow columnar evergreen conifer, tolerant of air pollution. Young bark orange-red, shiny dark green needles. 2 inch (5cm) long cones appear after 5 years. Sometimes grown for Christmas trees. Any soil including shallow chalk. CONIFER 45ft x 10ft (14m x 3m) in 20 years, ultimate height 70ft (21m). SWEET BOX (Sarcococca hookeriana humilis) (Christmas Box). Dense evergreen with glossy dark green leaves and tiny, highly fragrant, white-tinged-pink flowers borne in the leaf axils in late winter followed by spherical black fruits. Excellent in semi-shade and a rich soil but also tolerant of dry shade. HEDGE Trim as necessary. For hedges up to 2ft (60cm). Plant 1ft (30cm) apart. Fast growing round-headed tree with bright green leaves that turn yellow in autumn. Tassels of green-yellow flowers appear with the leaves in spring, followed by winged fruits in autumn. Any well drained soil, wind and salt tolerant. TREE 35ft x 15ft (11m x 4.6m) in 20 years, ultimate height 100ft (30m).